Should house prices be a consistent multiple of income? People can deal with their basic needs using a smaller and smaller proportion of their income. This leaves more and more to spend on your mortage. Here’s a little model to demonstrate what I mean: Let’s pick a point in the past (1995) where someone is making an amount of money (50 grand). 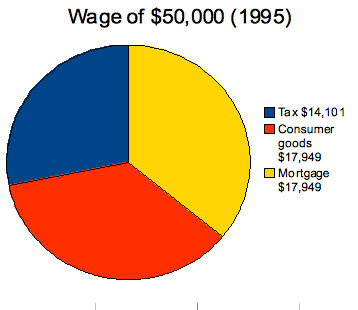 Imagine that person spends $17,949 on consumer goods and services and the rest goes on their mortgage. 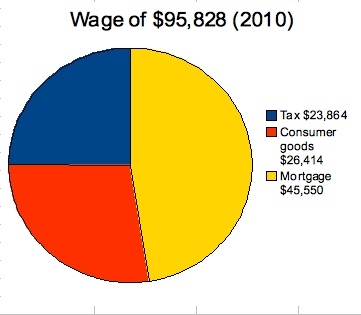 The ABS tells me that wage inflation means the same wage is now $95,828. CPI means that the same basket of consumer goods now costs $26,414. Doing the same job, buying the same stuff and obeying the tax laws, a person now has 2.5 times as much to spend on housing! The big assumption here is that housing budgets expand to take up the left over money. This is not perfectly realistic. Consumption expenditure will also increase. But the people do scrimp to pay their mortgage. Because they expect growth, they want to make this investment as big as they possibly can. There may be other factors distending the old ratio of household income to housing price. Multiple income earners. What proportion of housebuyers are now a two income team? How has this changed? More flexible labour markets mean a more stable income stream. I want to conclude, like an economist, by hedging my bets. I’m not saying ‘housing markets won’t crash’. I’m just saying that a changed price to income ratio doesn’t make it axiomatic that they will. I also think that a lot of this discussion obsesses on averages and medians. It’s not that useful in this context. The ABS reports today that median tshirt sizes have increased to L. Skinny people are petitioning the government to do something, anything, so they are not left naked in the rain. “Adequate clothing is a basic human right” said one protestor today, baring a remarkably slender torso. Measures of central tendency do not help us determine whether everyone can find a match that’s right for them. Some say that Australia’s very high house price is a consequence of the capital gains tax free status of the family home. Thus people put the majority of their money into something that will be tax free. “More flexible labour markets mean a more stable income stream.” I found this statement a bit curious. My career has been mostly in jobs that have been on contracts with no guarantees of renewal. Many jobs that would have been on more or less “tenure” or ongoing basis in the past are now on revolving one year contracts or “long” term contracts of three to five years. Maybe it’s just me, but I grew up with knowledge of 17% interest rates in the 80’s boom, and finished high school in the recession in the nineties and pretty much had to leave the country to get a job in the area I studied in uni as did a lot of my friends. In the early nineties you were doing well if you could get a waiting job after your graduation. I’m paying off my mortgage on a fast track and expect things to get worse not better. Have you watched Elizabeth Warren’s lecture “The Coming Collapse of the Middle Class” – sure it’s about the US but it still has many similarities with Australia. I’ll concede that point. I guess I was imagining that if your factory went broke, back in the day, you were done for. These days it’s more normal to find a second or third career. But I suppose that flexibility cuts both ways, and that might make it harder to take on a big mortgage. Christopher Joye from Rismark seems to be able to account for the rise in prices fairly well, but I think Robert Shiller’s emphasis on the stories people tell in explaining markets also has a strong reinforcing effect. Coming back to Australia in 2005 I was surprised at the sudden popularity of real estate. Everybody was talking about it. After 15 years of property rises and general strong economic performance it would be surprising if people wouldn’t be prepared to overspending on property. Yeah, i’m pretty much screwed. 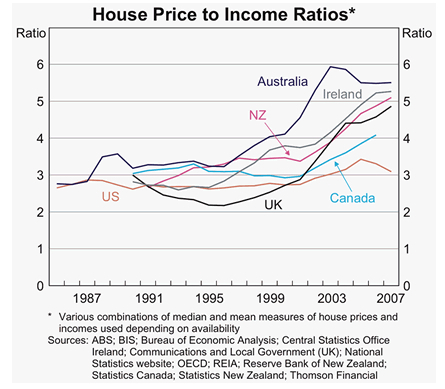 Talking about house-price ‘inflation’ is difficult. It’s easy to compare the prices, but hard to compare the value of houses over time. These days, new and renovated houses are bigger, better designed and full of features. But even existing, unchanged houses offer a totally different set of features to a buyer. The neighbourhood a house is in may have undergone change. Could be that the local shops have all closed down, and the traffic between there and likely destinations is much worse. In which case the same house offers much worse value. Or it could be that the neighbourhood has gentrified, a bunch of quality services are now on the doorstep, proximity to the train station is now considered a plus, and the address is now perceived as prestigious. In this latter case, the house may now offer a much better value proposition to whoever buys it. Also, relative to recent history, homes are reasonably affordable. Previous Previous post: Car Future Part II – Robot Cars.